DiMonte Henning and Ben Kindler in BIG RIVER: The Adventures of Huckleberry Finn. Photo by Paul Ruffolo. Blessed be the theater in times of strife. This simple statement doesn’t come from some noted philosopher, just from me. At a time when we’re being consumed by hatred and deep division, it seems only fitting that First Stage, the acclaimed theater group for young people and families in Milwaukee, is giving its audiences a much-needed reprieve with a world premiere adaptation of the Tony Award-winning Broadway musical Big River: The Adventures of Huckleberry Finn. The musical opened recently in the Todd Wehr Theater of the Marcus Center for the Performing Arts. From its rousing opening number, “Waitin’ for the Light to Shine” right through “Muddy Water,” the final number performed by the entire company, it’s obvious this is a Broadway-level production. The show is overflowing with inspired performances and beautiful songs, performed by a first-rate cast that’s taken the importance of the material to heart and runs with it. Ben Kindler, DiMonte Henning and cast in BIG RIVER: The Adventures of Huckleberry Finn. As Big River opens, we meet two youngsters who are best friends: Huck, a boy with white skin who yearns to explore the world around him, and Jim, a boy of color that was born a slave but says that he “always felt free.” When the Widow Douglas admonishes Huck’s thirst for adventure by telling him point blank, “Do what you’re told, like Jim,” Huck and Jim set off on a raft and let the majestic Mississippi River serve as their guide. Huck wants to help Jim find freedom and reunite with his family. The friendship between the two boys grows as they learn more about each other while eating catfish and cornbread. The plot takes a suspenseful turn when Huck and Jim agree to take on two other travelers who turn out to be a pair of con artists called the King and Duke. And here is the weakest element of Big River. The addition of the King and Duke characters, in my mind, dilutes the power of the story, taking the focus off Huck, our hero who is performing a noble deed for his friend, and Jim, who wants to meet up with the mother and sister he misses. I would’ve preferred a two-character plot focused solely on Huck and Jim, and how their growing love for one another, despite differences in their skin tones, manages to shatter the very hatred that threatens it. But, thankfully, this production of Big River offers more than its share of redeeming qualities. First, there’s the spirited direction and clever choreography of Marti Gobel. Under Gobel’s creative tutelage, the mighty Mississippi is depicted by 10 youngsters dressed in ice-blue costumes, who act out the ripples of a river through a series of graceful, beautiful movements using their arms and legs. The Mississippi is crucial to the plot of Big River because it represents the beauty of nature, adventure and the cleansing of souls. The kids portraying the river may not even realize the important role they are playing in this production. Then, there’s the live bluegrass music, complete with fiddles, guitar, harmonica and piano, under the direction of Paul Helm, that gives Big River a delicious Southern charm that’s irresistible. And finally, there’s the cast, which defines the word “talent” perfectly. DiMonte Henning, a Milwaukee native, is outstanding as Jim, the young slave. Henning’s stunning interpretation of “Free at Last” was the ideal showcase for his lovely voice; his vocal talents should no doubt carry him to loftier theatrical pursuits in the future. Ben Kindler turns in a fine performance as Huck, brilliantly capturing his character’s generous spirit and adventurous nature. Other cast members who score with colorful portrayals are Matt Daniels and Chris Klopatek as the King and Duke, respectively, and Kat Wodtke as the Widow Douglas. 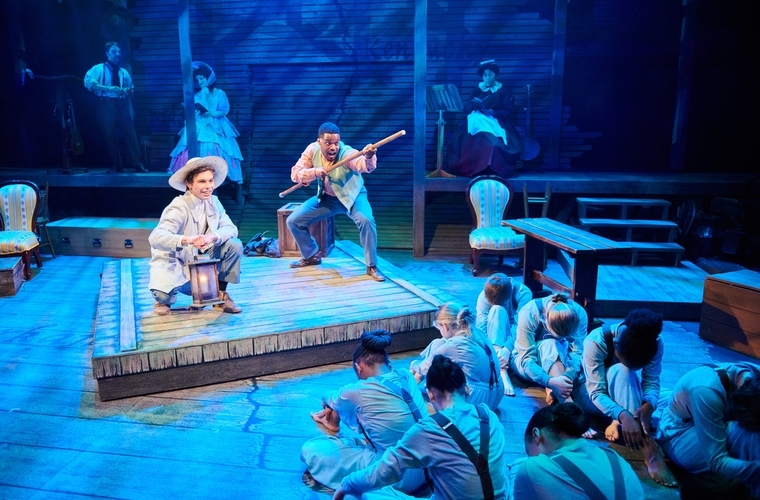 This ambitious adaptation of Big River: The Adventures of Huckleberry Finn reminds us in an entertaining, refreshing way that instead of constructing walls we should strive to build bridges. Big River: The Adventures of Huckleberry Finn will keep on rolling through April 14 in the Todd Wehr Theater of the Marcus Center for the Performing Arts, at 929 N. Water Street, in the heart of downtown Milwaukee. For tickets, go to www.firststage.org or call the Marcus Center Box Office, (414) 273-7206.